Railcar leasing doesn't have to be difficult. TCIX Rail focuses on providing high quality rail equipment, and leasing services to help meet your needs. We own and leases a comprehensive fleet of various size tank cars and covered hopper railcars, which are available for long and short-term leases. Let us help you move your commodities or industrial products. We have a dedicated fleet management staff that works hard to ensure our railcars moving and operating efficiently. If you are new to the process, we can walk you through it step by step. Call one of our sales staff at (918) 495-3500 with any questions you may have. 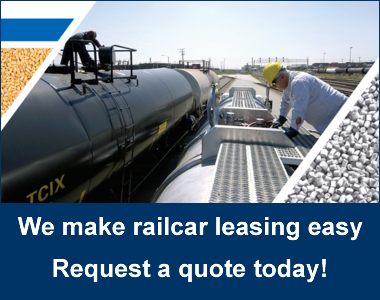 Fill out our quick and easy form to get started on a railcar leasing quote today! Click one of the buttons below to get started. We’re known for railcar leasing made simple. Your cars are on the way! • Full-Service Lease: Among many items included are maintenance and administrative responsibilities. In a full-service lease TCIX Rail (the lessor) gives the lessee the exclusive right to use the leased asset for a specific period and under specified conditions but retains ownership of the car. TCIX Rail is also responsible for the costs associated with operating the rail cars, which typically include normal car maintenance, insurance, and taxes. However, expenses caused by the product shipped or extraordinary maintenance items caused by the lessee could still be the obligation of the lessee. • Triple Net Lease: These are available for lessees who prefer to manage their own maintenance. In this lease type, the lessee agrees to pay all taxes, insurance, and costs associated with repairs, replacements and maintenance of the property in addition to the monthly lease fee. • Sale – Leasebacks: This transaction can benefit both the buyer and seller. In a sale-leaseback the owner of the property sells that property to TCIX Rail and then leases it back from us in either a full-service or triple net lease. This allows the original owner to obtain capital, while still retaining use of the property. TCIX Rail is an agile company which offers quick responses on a variety of railcar equipment and leasing options. We have been in the railcar leasing business since 1985 and we bring that experience to the rail market. Our experience, financial performance, and industry knowledge put us in a unique place to partner with our customers. We know that your success will equal our success and we can grow together as partners by helping each other achieve our best potential. We are proud to own a growing and diverse fleet of various size railcars which serve a multitude of market segments vital to the industries and economies of North America. Our fleet includes, but is not limited to, covered hopper railcars, lined and unlined tankcars, with various available linings including high and low bake epoxy and natural/chlorobutyl rubber. We offer special equipment options such as: stainless steel, compartment, magnetic gauge devices, and more. • Lease administration- We offer long and short-term leases, with or without linings, on a variety of tank cars and covered hoppers. • Cleaning- Let us manage the cleaning of your railcar equipment at the shops. We can handle routine and the most challenging of railcar cleanings. • Mobile Railcar Cleaning- Our mobile cleaning units come to where you need them. • Equipment Storage- We have storage arrangements across the nation. Our staff can help you determine, based on timeliness of delivery and which it is most cost-effective option. Why lease? Use your resources to focus on growth, while structuring and minimizing risk, and decreasing management costs. Partnering with TCIX Rail gives you the ability to focus on your product lines and what you do best, while we focus on getting your product where it needs to go and delivered on time. Let transporting your product be our concern. TCIX Rail has a long history of services in handling bulk dry and liquids and commodities. When coupled with our transportation, storage, and distribution network, we can make the delivery of your raw materials, products, and byproducts one of the most reliable and cost-effective areas of your business. Our team of industry veterans, who have extensive experience in all aspects of rail operations and railcar leasing, maximizes the railcar leasing value for our customers. By partnering with TCIX Rail, our customers receive many of the financial and operational benefits of our integrated business model. We strive to understand your needs and we will develop the best solution to deliver your products in a timely fashion. With the benefit of our experienced fleet logistics, mechanical, and transaction team members, we will handle all aspects of the railcars including scheduled maintenance and program repairs. TCIX, Railcar leasing made simple.